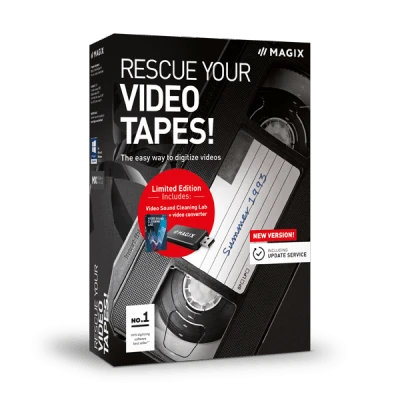 MAGIX Rescue your Videotapes! offers a unique solutions to digitize your old video cassettes from home. Your child's first steps, your wedding or family gatherings: It's never been easier to secure, edit and share your analog videos! Your memories, in a new package. In addition to the software, you'll also get a universal USB video converter – only with MAGIX. With its SCART, S-Video and RCA connectors, it offers compatibility with all analog video sources: VHS, S-VHS, Video/Hi/Digital 8, Betamax and DV. Cut out individual passages, adjust colors and contrast and add effects and audio commentary. Easily remove noise such as wind or camera noise with Video Sound Cleaning Lab. You can efficiently save digital videos on the hard drive or optical media such as DVD and Blu-ray disc. You can even share on YouTube or Facebook straight from the program. Wipe that dust off! Time for fresh effects! From quick start to video editing wizards: The program supports you at every digitizing step. Fully automatic color, brightness and contrast correction improves the quality of your videos and saves you lots of time. Enhance your videos with special effects. Add camera tracking shots, zooms and mirroring effects and video effects using drag & drop. Rescue unique recordings: Thanks to the new image stabilization, you can automatically smooth shaky or blurry videos. Dynamic fades for perfect transitions: Create impressive 3D transitions give your videos a creative touch. Create impressive slow motion scenes without jerky frame movement – stretch time with smooth playback. Create proxy files from your videos with just one click to start smooth editing of your clips. Add optical flare and a professional look to your videos with opening and closing credits. Burn multiple videos in a space-saving manner to the same disc. This way, you'll an overview of all your videos during presentation. "Based upon the results I achieved with minimal effort I would happily recommend the product."